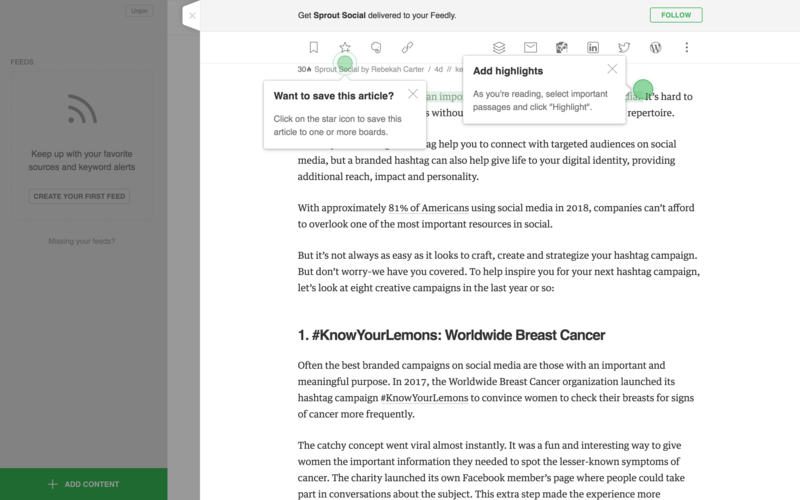 Feedly highlights the hotspots they want users to notice with a soft, transparent green color, in contrast to their minimalist white background. These are subtle indicators of which areas users will most likely use and see the most value in. Upon clicking on the green circles or highlighted text, concise tooltips pop up explaining the highlighted feature. The concise copy and explanation are clear in their instructional value. What's also nice is that Feedly doesn't bombard new users with tons of small and scattered tooltips. Focusing on just two features doesn't overwhelm a new user when they are getting to know the tool.